Obviously this is to do with the change in time period, but it really helps the game stand out, and its sense of place is unmatched in period open world games. The game is just stunning, and you really have to see it in action before you can appreciate even tiny little detail. You will really appreciate the games new splash of colour when you are walking through the nighttime Carnival, with fireworks going off all around you, or when you are escaping on horseback through the mountains. One of the biggest flaws about Assassins Creed 1 was the weak lead role of Altair; he really was a boring character. As well as the bland, uninspiring narrative, it led AC1 to feel quite stale. Luckily, this has been addressed here, and your new protagonist, Ezio, is a far more likeable, talkative and humorous character, while the narrative is far more cinematic, adding regular cut scenes that build on each character and it helps make the game feel so much more organic. The back-story also helps understand Ezio’s motives to becoming an assassin, and as a player you feel so much more included in the story, instead of a bystander to the cold, uninvolved nature that was so apparent in AC1. As well as the improved cinematic storytelling style, AC2’s plot is far stronger than the last. 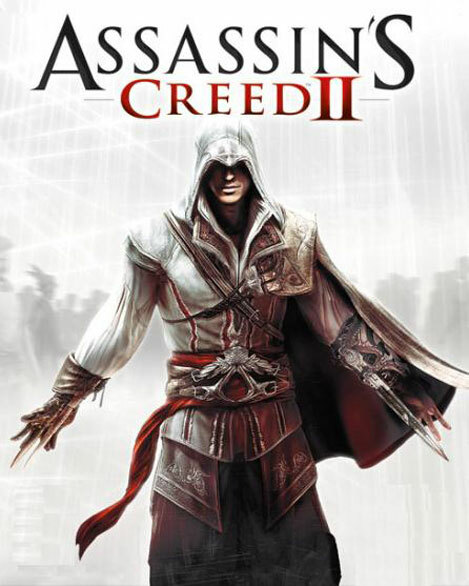 The absence of a weak and frustrating ending, a developed cast of characters, and the way that AC2 is set over the period of Ezio’s young life, mean that the scope and strength of this story is so much more concise, and while the addition of cut scenes might lead to the game feeling more linear, it is a worthy sacrifice considering the improvements that have been made here. To further strengthen the game, the time that you play in the real world is far more endurable, and while still a little boring, the fact that you can do more than just walk means that you may hate the scenes a little less than you did in AC1. As I said previously, AC2 is a lovely looking game. Whether you’re standing at the top of a tower, looking over Florence’s nighttime vista, or riding through the countryside on your horse, AC2 is everything you want to see in an open world title. The animations are still top quality, with the fight scenes looking professionally choreographed, your free running moves flowing easily from one jump to the next, and the enemies and crowds moving so realistically that sometimes you will simply have to stop and spectate your surroundings. Its also so incredible that with such a vast, good looking world to explore, that you almost never have to look at a load screen, and I didn’t encounter one bit of hiccup in the visual quality throughout my entire playthrough. The audio work is also worthy of praise, providing a wonderfully enticing score that really fits the setting perfectly, and every little audio detail is so integral to the immersion of the world that without it, the game world would feel so much less impressive. The combat is satisfying, with the clashing and clanging of swords and the boom of your hidden pistol shuddering the speakers, and the scripted voice work is great, with several laugh out loud moments contrasted by some emotional scenes. So many improvements have been made to AC2’s gameplay mechanics that it makes the game so worthy of commendation. This is a true sequel, where the problems from the first game have been addressed in a way that shows from the beginning. As well as a stronger plotline, the assassinations have been improved dramatically, with an absence of repetitive mission structures that were greatly criticised in AC1. Instead of the monotonous ‘investigate, infiltrate and assassinate’ structure that was apparent in every single main assassination in the original, you now get a more organic approach to each assassination, as you have to complete various quests and objectives before you kill the target. The assassinations themselves are a lot more varied now, and the inclusion of aerial attacks etc mean that you will have a much easier and more enjoyable time taking down your enemies. The double assassinations look awesome and it makes you feel like a badass just walking up to two guards to stab them in the face. This leads me to the other various combat improvements that have been made here. You can now disarm your opponents, which gives Ezio a great advantage in battle when he is unarmed. The disarm animations are fluid and impressive and sometimes gruesome, especially when disarming enemies with larger weapons. Also, as well as an improved combat system, there are various shops located in each city from where you can purchase weapons and armour, which is also upgradeable as you progress. This not only adds a new layer to the gameplay, but also adds a new organic progression system, which furthers the believability of the cities in-game. You also have a Villa, which acts as a base of operations in AC2. It is a really cool area to explore, which has architectural and artistic upgrades that can be purchased to raise the worth of the property, which in turn returns you with money to be then be further spent on weapons and armour upgrades, if you so choose. As well as combat improvements, gameplay features such as the ability to swim, which is a welcome addition considering the Venetian setting, eliminates the frustrating factor of death upon contact with water. It also adds a new way to assassinate your enemies, and an extremely useful way to escape from an unwanted confrontation. You can now also pay off thieves, whores and peasants to help you on your way. They will distract your enemies so you can slip past unnoticed, or take them down quickly and quietly. It is also now possible to hide in any large crowd of people, a great improvement on the stale mechanic in AC1 of hiding with a group of scholars as they pass through the city. It’s a much more fluid and natural feel to the stealth experience. Above all this, a day/night cycle has been introduced, which furthers the immersion of the game world; no stealth title should be without the opportunity for nighttime assassinations. As well as the main missions, there are several options of side missions for you to dig your teeth into. Whether you’re searching through hidden tombs in Prince of Persia style platforming to find ancient artifacts, or performing assassinations on the side of the main quest, there is a lot to do here other than stick to the beaten track. AC2 does a good job of keeping the games pace at a consistent level, always presenting you with the next story mission on your mini-map, so you are never at a loose end, unless you choose to be. There are also various puzzles located around the world that provide a deeper look at the conspiracy theories surround Assassins Creed. These puzzles are really challenging, and will definitely take up a large portion of your time if you aim to complete them all. The main storyline clocks in at around 15 or so hours, and if you explore everything that AC2 has to offer you can easily stretch your game time to 25-30 hours. Considering the beauty of the game world, and the vast amount to do here, its definitely worthwhile to do as much as you possibly can, simply so you don’t have to leave. Assassins Creed 2 is worthy of praise due to the vast amounts of improvement that every aspect of that game has undergone. Ubisoft has truly listened to every criticism that was made and tried its best to deliver on all of them, and it has mainly succeeded. Boasting a stellar game world, a good story with lots of personality, a fluid and addictive free running system, gruesome and awesome looking combat and vast amounts of side quests that lie off the beaten trail, Assassins Creed 2 is absolutely fantastic. Even if you were unsure about how it may turn out, it will definitely not disappoint you. Apart from the relatively unchallenging nature of the game, and the fact that the modern-time gameplay sequences, (while improved) are still boring, there is very little to fault here. One of, if not the best looking open world title ever to grace a console. It truly looks phenomenal, capturing every last detail you could possibly want. Matching the visual prowess, the audio work is stellar, with great voice acting and sumptuous score work. A decent length story is strengthened by the amount there is to do here if you choose.